1. What does MINERVAMINDS mean? Minerva was the Roman goddess of wisdom and strategic warfare. From the second century BC onward, the Romans equated her with the Greek goddess Athena, goddess of medicine and wisdom. 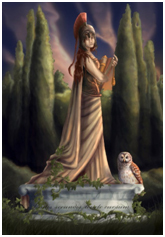 She is often depicted with her sacred creature, the “owl of Minerva” which symbolised her association with wisdom and knowledge. MINERVAMINDS was chosen to symbolise our core aim, bringing the power of wisdom and knowledge to create powerful strategies that heal the mind. 2. What kinds of problems are seen at MINERVAMINDS? 3. How do I know when I need to see a specialist? Many parents are not sure when or even if, they need to see a Developmental and Behavioural Paediatrician. Parents will often become confused by a myriad of well meaning but ill-informed or contradictory advice from friends and family members. A good place to start getting some perspective is discussing it with your GP. Sometimes it may seem easier to take a “wait and see” approach. Whilst this may be a reasonable option in some settings, with child development, time is of the essence. This is particularly so due to the phenomenon of “critical periods”. These are specific age periods whenconditions are optimal for certain aspects of developmentto initiate and progress smoothly. Once these critical periods pass, so does the window of opportunity to develop optimally, making catching up considerably more difficult. This is the basic neuro-developmental principle that underpins the importance of early intervention. Furthermore, developmental milestones are built upon each other with a complex interdependence between differing areas. This can mean that a single problem in one area may impede development elsewhere, compounding the level of disability. For example; language development has a critical period around the age of 2, and if there are difficulties, then socialising becomes more challenging around the age of 3 when social play increases. Social difficulties can then lead to behavioural problems which, by the time the child reaches school age, may present as learning difficulties. Left unattended, these children can become disaffected teens that then become difficult to reach. This domino effect is unfortunately all too common as is accurately teasing out the underlying factors which need attention. Finally, trust your instincts. Most parents know their children better than anyone else. If something doesn’t seem right, it probably isn’t – it may not be serious but it probably means something. For more help, see our Guiding Questionnaire devised to assist parents with this difficult decision. 4. How many sessions will my child need? The number of consultations will depend on the complexity of the presenting problem. It may take more than one consultation to fully evaluate your child’s difficulties, and develop an effective management plan. A comprehensive developmental and behavioural assessment is the cornerstone of achieving successful outcomes. However this a complex, time consuming process that requires a multifaceted approach, tracing the entire arc of your child’s development often from different sources, and then requiring careful evaluation and integration. The detail of the assessment can be varied according to the child’s and family’s needs and priorities and we are happy to work with families to come to an acceptable arrangement on the consultation process. Our fees may be greater than those of a General Paediatrician however as the problems tend to be more complex and multi-factorial, our consultation tend to be longer. Paediatric Specialist consultation fees are correlated with the time spent with you and your child. Our fees are comparable with other Developmental and Behavioural Paediatricians offering similar services. You will need a Medicare Card and a current referral from your GP. The amount you will receive back from Medicare will also depend on a number of factors (length of appointment, initial versus subsequent consultation, diagnosis, complexity of problem). For your convenience, we are able to process your Medicare Rebate on the spot so you can have the money rebated directly back into your account before leaving your appointment. Our reception staff will be able to advise you regarding current pricing. Developmental Assessments are also available in the public health system, so check with your local doctor for services available in your area. Unfortunately, waiting times tend to be longer. 6. Wouldn’t it be better to see an allied health specialist first? Sometime it is. For example, if you are only concerned about one problem, such as a simple speech problem, you may only need to see a Speech Pathologist without requiring a Paediatrician. However, with more complex problems, it may be more efficient to see a Developmental Paediatrician first, who can give you a broader overview of the problem. As a Behavioural and Developmental Paediatrician, my training allows me to make a comprehensive assessment of all possible contributing factors allowing an accurate, integrated assessment and hence allowing an effective management plan that may save both time and money over the longer term. For more help, please ask for our Guiding Questionnaire devised to assist parents. 7. What is a Developmental Assessment? A Developmental Assessment is a multifaceted assessment, collecting information about the physical, neurological, cognitive, language, fine/gross motor, emotional, psychological and social dimensions of your child’s functioning, often from a number of differing sources and from across the entire arc of your child’s life. It then requires the careful evaluation and integration of all these pieces of information to make sense of the problem, and provide a coherent and comprehensive understanding of your child in order to then develop anoptimal management plan. 8. What is the difference between an assessment and “testing”? For example an ADHD Assessmentmay lead to specific neuropsychological testing, Learning Assessments may require testing using specific tools developed to evaluate the problem, Developmental Assessments use the Griffith-III Developmental Assessment tool, Autism Assessments use the ADOS-2 (Autism Diagnostic Assessment Schedule-Second Edition). Multiple other tools including psychological questionnaires to assess mood and emotion may be chosen to explore specific areas and ensure the assessment is efficient, informative and tailored to your child’s and family’s needs. 9. Who is going to do the assessment or testing? Dr Zalan will perform the initial assessment which will give her an overview as to what further testing or investigation may be necessary. The decision as to who is the most appropriate person to perform further assessment or testing will depend on the nature and complexity of the presenting problem and any previous investigations already performed. Some assessments are only done by Developmental Paediatricians, others can be performed by other health professions (psychologists, speech therapists, occupational therapists, neurologists, neuropsychologist). The most appropriate choice and reasoning for our decision will be discussed with you. Our aim is to be comprehensive but efficient and not waste time and resources covering old or unnecessary ground. 10. Will I get a report? Yes. An important part of the assessment process is the generation of a comprehensive Medical Report summarising all important aspects of your child’s history, assessment, testing results, evaluation, and diagnosis and outlining a proposed management plan. This is a vital document to ensure coordination and “everyone being on the same page”. A copy of the report will also be given to you and will only be sent to others with your consent. Seeing a Developmental and Behavioural Paediatrician is a good way to improve your understanding of your child’s behaviour. Each child is different and bring a unique constellations of strengths and vulnerabilities. We avoid using labels, but may use diagnostic categories where appropriate. The main reason for this is provide an explanatory framework helping make sense of often many different symptoms and problems. It is also a useful when communicating with other professionals involved in your child’s care. However, what is most important is that the child and family develop an understanding of what is happening in their child world in a clear, coherent manner. This is often referred to as a “Formulation” which is more like a short story explaining how and why your child has came to present in this particular way, at this point in their development. 12. What is an Autism Assessment? An Autism Assessment consists of child specific assessment (using the ADOS-2, which is the gold standard Autism Diagnostic Assessment tool) parental interview, followed by feedback and management planning sessions. If the child fulfils the diagnostic criteria for Autism Spectrum Disorder, the Medicare Item number 135 can be assigned, allowing the child access to the “Helping Children with Autism” Medicare funding package. 13. How many consultations will we need? The number of consultations will depend on the complexity of the presenting problem and may take more than one consultation to fully evaluate your child’s difficulties, and develop an effective management plan. The length of the assessment may also vary with the child’s capacity to cooperate with some of the formal testing that may be required. While every effort is made to spend time efficiently, some children are very cooperative and engage easily, whilst others need more encouragement, support and time. 14. How long will the consultation take? A “standard” Paediatric consultation usually takes 30 minutes however, Developmental and Behavioural consultations frequently take longer. Our experience has shown that initial consultations often take up to one hour. Furthermore, we realise that it often requires 2 or 3 sessions to get a full assessment of most children with complex problems. 15. What is “FAST TRACK” or “EXPRESS” Assessments? Usually initial consultations are scheduled WEEKLY or FORTNIGHTLY, if more than one session is required. FAST TRACK assessments are offered where the sessions are arranged on a daily basis over a 3 to 5 day period.This may be suitable for younger children, who find it difficult to spend many hours at a doctor’s office. We recommend the initial interview in the morning, further assessment in the afternoon and feedback the next morning. For others, having a single session on consecutive days may better suit the child and family. EXPRESS assessments can be arranged, meaning that up to 3 sessions can be booked for the same day. This may be more suitable for older children who are able to handle a full day of assessment. This may be especially convenient for country or interstate patients. SCHOOL HOLIDAY assessments are also available, often suitable for families from regional areas or for parents who want to avoid their child missing any school time. 16. Should I come alone to the first consultation session? I am worried it may be a negative experience for my child. We encourage you attending the initial consultation with your child. We are experienced in dealing with anxious children and our Clinic layout and its processes have been built to ensure the process is as relaxing and caring as possible. A short meeting may actually reassure your child about the environment, the doctor and the entire process. Seeing your child in the clinic gives considerably more information about their behaviour and interaction style, helping us choose the most suitable assessment tool and management plan. However, you would like to obtain an opinion without your child’s attendance,we respect your choice. Most children are aware that there are concerns about their behaviour, development or concentration. However it may be necessary or more appropriate at times for the child to spend part of the assessment in the waiting room, allowing parents to be more open and direct about their concerns. 17. Will the doctor complete the NDIS application form for us? The NDIS (National Disability Insurance Scheme) application contains information about the child’s current functioning and needs. The doctor will assist you in completing this after the feedback session, giving you the best opportunity to receive maximal Government financial assistance. If a child had an assessment a few years ago, a review appointment is recommended, to establish the current functioning level of the child and the current supports required in order to accurately complete the NDIS application. 18. Will the doctor complete the Carer’s Allowance Form for CenreLink? Yes. This will be completed if your child is known to the doctor and you provide an application form that contains a signed parental consent. We understand that you need to schedule appointments that suit your family’s need. If you need to change your appointment time or need to cancel, please give us 48 hours notice, so we can offer that session time to another family. We often have families desperate to get seen as soon as possible. Hence, cancellations under 24 hours may attract a cancellation fee. Two hour free parking is available at Westfield Bondi Junction. Parking is also available in Grosvenor Street at Wilson’s parking next to the Bus and Train Interchange for a small fee. 21. Can I get a repeat script without an appointment? Usually not. Many medications that are prescribed by a Developmental and Behavioural Paediatrician are restricted “Schedule 8” drugs. This restricts our ability to prescribe repeat scripts unless there has been a clinical review.